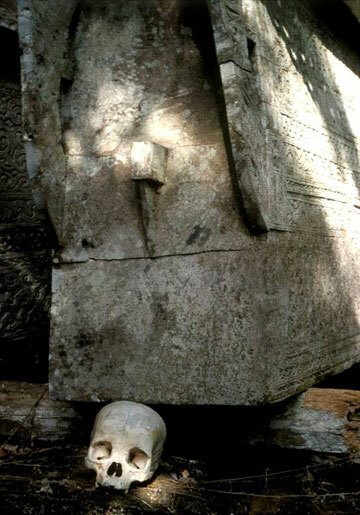 With its incredible topographic and cultural diversity, Indonesia remains a puzzle to many outsiders. Historians, anthropologists, and politicians have struggled to define the precise contours and identity of this sprawling archipelago. Having lived and traveled in this wondrous land for 16 years, I would suggest that the unity of Indonesia is in fact aesthetic. Each of its multiple strands contributes to a delightful opening up of the senses and to a saturation of pleasurable feelings. Indonesians intuitively understood this in naming their country Tanah Air, a fusion of soil and sea. The dramatic setting underlies the unfolding beauty of practices and beliefs that touch every nerve of human existence. Indeed, Indonesia awakens a synergy of the senses; we move from the obvious stirring of the eyes and ears to the more intangible, but equally thrilling, arousal of smells, taste, and touch. With the photographs I’ve chosen, I hope to open your pores and touch the deepest chords of your being, in imitation of my own fragrant journey across the enchanted isles. 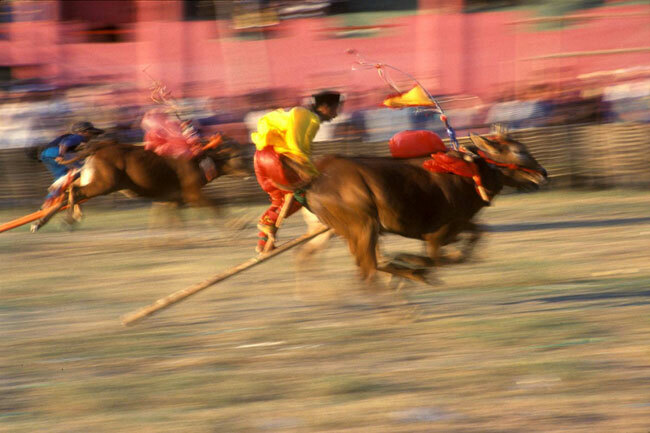 The passionate blur of “kerapan sapi”, the bull races on the island of Madura, begins our journey on a momentous high. The preparation and setting for the event are equally spectacular. After the toil of the harvest season, the bulls enjoy a special treat combining fodder with a gourmet concoction of crushed ginger, pepper, honey, beer, and a hundred eggs! Surely this potent brew would rouse any animal (or human for that matter) to extraordinary feats of athleticism, but some tender loving care doesn’t hurt, either. A soothing massage and inspiring whispers in the bulls’ ears from the owners before the race act as perfect catapults for the ensuing frenzy. The real heroes of this amazing spectacle guide their thundering charges on a bamboo sled or “nanggala”, attached to two bulls. Having to harness and channel the energies of a released demonic power, these jockeys seem to exist in a surreal world of swirling motion and chaotic control. The bulls and their masterful charges leave us reeling with the spontaneous thrill of life at its outer margins. In Kalimantan, another region known for its rich indigenous traditions, my camera searched for living traces of ancestral culture, and was well rewarded at the “lamin” or longhouse of the Dayak Benuaq group at Mancong and the elongated ear lobes of the elderly Dayak Kenyah women. However, I soon found myself delighting in the energy and laughter of the younger generation. We were surrounded everywhere by pranks, pouts, and peeling knees, overseen by the warmth of child-rearing that seems to be the natural asset of all Indonesian people. 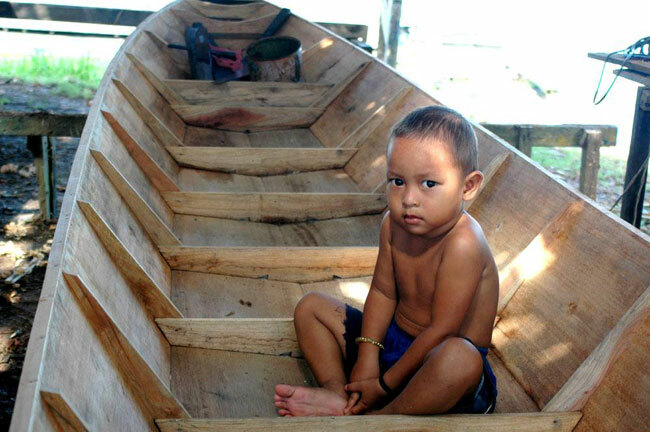 My slightly reluctant model at Muara Mantai sat within the handsomely crafted boat of his father, preparing him for a life amidst the riches and swaying tides of the river. Indonesia is a young country, surging with the hopes and desires and aching vitality of fresh blood. While we may regret the passing of some old ways, this land is ripe for the renewal of an unleashed vigor and new dimensions of beauty. Stunning landscape vistas complement the aesthetic appeal of the people and their cultures. Upon our arrival in Manado, the eyes feast on the beauty of the Minahasan people, refined and tempered by an ethnic cauldron that combined groups from mainland South East Asia, Indonesia, and the Philippines with the colonial blood of three European tribes – the Spanish, Portuguese, and Dutch – as well as enterprising Chinese migrants. Blessing this land with fertility and exuberant color stand tall volcanic cones, forming a protective ring around the peninsula. At the pleasant resort town of Tomohon, the magnificent vista of Gunung Lokon energized my lens. Appropriately, the summit carried a crowning layer of foggy cloud, underlining its mysterious majesty and its active qualities. 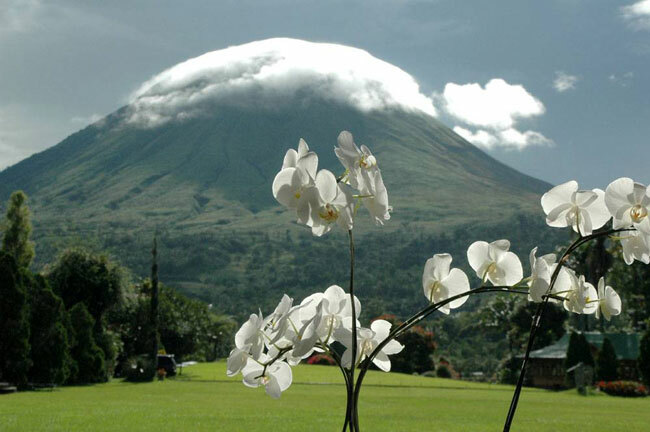 “Anggrek bulan” (the serene white orchid, literally “moonlight orchid”) enframe this ethereal scene, for Tomohon is indeed “Kota Kembang”, the Flower City. This is the perfect setting for the exuberant Minahasa culture, with its celebratory dances, the lilting tones of the “kolintang” (wooden xylophone), and the fiery gastronomic juices released by the spicy cuisine, layered with the subtle flavors of the bamboo cylinders used in its preparation. Joy and generous hospitality come naturally to these delightful people. Of sweet-odored mist and emerald grain”. 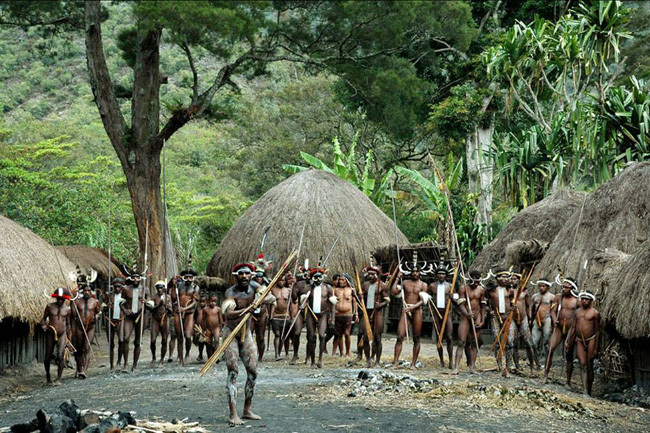 Papua brings you the thrill of encountering human origins and the crafting of our earliest civilizations. The handsome Dani warriors, accompanied by apprentice boys and “cheer leading” women, hark back to a tradition of “weem” or war, inevitable in a group of 50,000 people divided into twelve alliances. However, from the standards of present-day warfare (or rather, butchery), an estimated annual death rate of 20 or 30 per group does not appear excessive. “Weem” has now become a mock spectacle, and Dani men continue to use the occasion to appear at their fearsome best. Pig fat adding a sheen on their sleek muscular frames, many bedeck themselves with precious ornaments of cowrie shell, animal fur, and bird plumage. The real beauty of the Dani people, though, resides in the region of the solar plexus, called “etai-eken” or “seeds of singing”. Fusing our concepts of soul and personality, the “etai-eken” are regarded as the vital center of every individual’s being. I find the connection between soul and singing a perfect affirmation of my passion for music. For the Dani, as for us, pleasurable sound creates the harmonious accompaniment of life, transforming and uplifting the inner self. From dizzying motion to serene calm, from the powerful mystique of ancestors to the spontaneous giggle of children, from volcanic stirrings to gentle waves, this archipelago fulfills a hunger for completion. By Vivek R. Bammi, photographer and author, “Indonesia: A Feast for the Senses” (Jakarta, PT Sukarya & Sukarya, 2005).